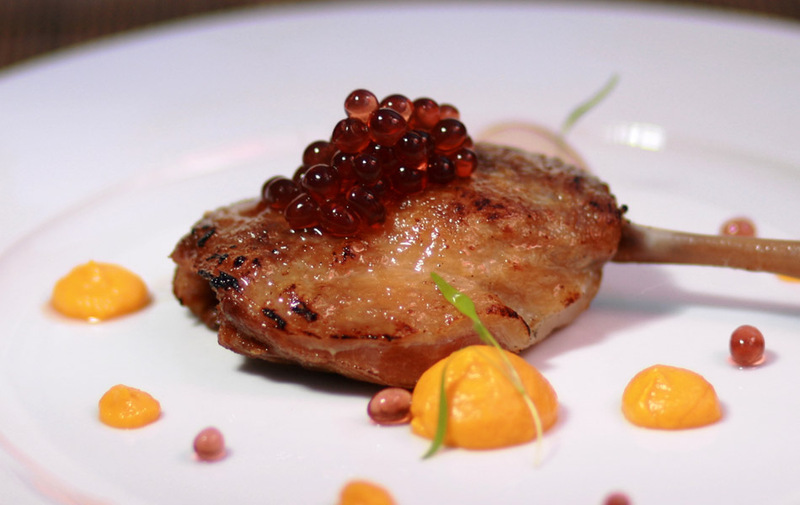 Duck confit is a timeless classic dish. Crisp skin and tender luscious fall off the bone meat….soooo good! It’s not a difficult recipe to prepare but you will need to think a couple of days ahead. I guarantee once you have tried it you will definitely add it as a regular to your dinner party repertoire. We have garnished our dish with Blackcurrant Flavour Pearls but Pepperberry & Cherry would be delightful too. You can prepare the duck up to 4 weeks ahead of your dinner party…this step will need to be started a day or two before you wish to enjoy the duck. Combine salt, zest, juniper berries & thyme in a bowl, then toss with the duck until evenly coated. Place the duck legs in a single layer in a dish/bowl. Cover with plastic wrap and refrigerate to cure overnight (12 to 24 hours). Preheat your oven to 100 C. Rinse duck with cold water then pat dry with paper towels. Place duck legs, garlic and bay leaves in a baking dish, then pour in the fat (you will need to warm it first in a pot) until duck legs are completely submerged. Bake until very tender and just beginning to fall off the bone (2 – 3 hours). Once cooked remove the dish from the oven but leave the legs in the fat and cool completely to room temperature. If serving another day you can leave the legs in the fat and refrigerate them until required. Preheat your oven to 220 C. Remove duck legs from the fat, scrape excess fat from the duck, being careful not to break the skin. Place legs on a tray or fry pan and roast until golden and crisp (20-25 minutes). Serve with a generous spoonful of Flavour Pearls a simple side salad and roast duck fat potatoes. How to serve cheese and make it shine...add Flavour Pearls!